A few years ago, at my urgent request, The Gardener tried growing Golden Bantam sweet corn in our small community garden plot. The year was dry, the corn came up poorly, and we harvested two small ears, one edible. Golden Bantam, an open-pollinated (non-hybrid, and certainly not genetically engineered) heritage breed, tastes like corn, and is sweet only if cooked within an hour or so of harvest. This year, following another urgent request, The Gardener planted 30 On Deck Hybrid Sweet Corn seeds. Burpee bills this super-sweet corn as the first ever designed specifically for container gardens. Fearing we might miss a crucial watering in containers and kill the precious corn, The Gardener planted directly in our double-dug beds, close to a water source, and close to us. Only 15 seeds germinated, including some struggling miniatures that may not produce. Happily, the nine largest plants sport tassels and silks on nine baby ears. Burpee promises two to three ears per plant in containers. Our anticipated yield (counting ears before they pollinate and ripen) looks to be almost 1000 percent ahead of our Golden Bantam experiment. We will see! Had there been other choices, we would not have chosen a super-sweet variety for this experiment. Our favorite corn, grown in New England, is Butter and Sugar, a bicolor that balances sweetness and corniness beautifully. The closest we can come in Kentucky is Briary Creek Farm's Ambrosia, which is mighty fine. With nearly all available fresh sweet corn leaning heavily toward sugariness, I appreciate new (to me) ways of cooking corn that balance that sweetness with some salt and savor. My first introduction came a few years ago during an "eat what we've got" beach lunch. A smart, tall, kind, good-looking son threw a bit of onion and fresh jalapeño into a skillet with some butter, and then added some cut-off, leftover Sugar and Butter corn. Maybe some bacon insinuated itself into that dish, too. I remember the results as addictive, and the yield as much too small for the beach-enhanced appetites around the table. Last weekend, near a large, almost ripe stand of Ambrosia sweet corn, friends hosted a fine gathering on a liltingly beautiful Bluegrass farm. In the kitchen, in the safe haven of a cast iron Dutch oven, Charred Corn slowly finished, bringing to vivid life a Garden & Gun magazine recipe (transcribed here) for this sweet and savory gathering. Ahhh, yes, that splendid juxtaposition of sweet corniness and savory, smoky, umami richness...plus a bit of cream. I'll go out on a corn branch here and assert that no dessert of my experience can satisfy like this earthy, utterly American dish satisfies. 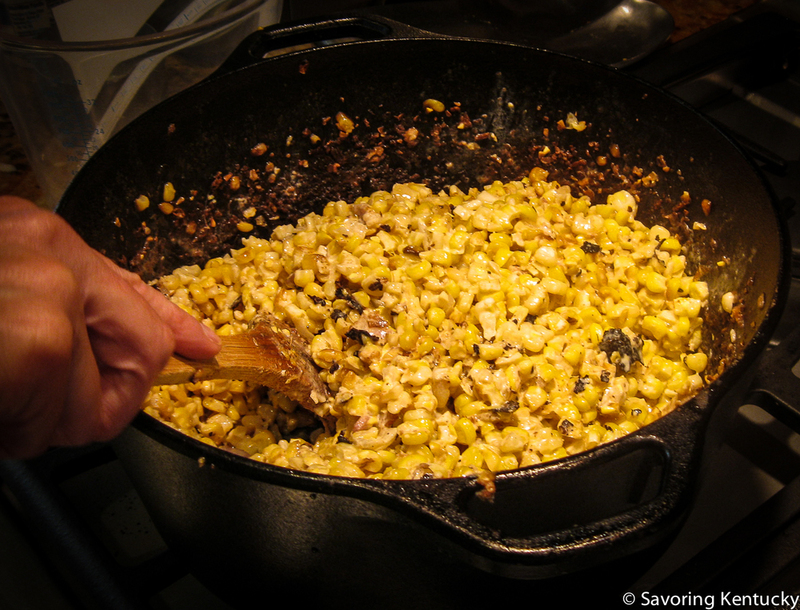 This week Jun-blog offers a short corn botany lesson along with a Fresh Corn Soup recipe built on a shrimp stock base. In last week's Fresh post, we included a rather miraculous way to microwave sweet corn and leave those pesky silks behind. This week we report that two minutes per ear is quite enough for silkless corn-on-the-cob nirvana.